Like the rest of the world, I check in on Heather Armstrong’s blog Dooce occasionally since from what I understand it’s required by law that I do so. After taking the requisite moment to fantasize about what it must be like to make enough money from blogging to support your family, I stumbled across a picture she posted of a piece of art hung with some interesting metal holders. 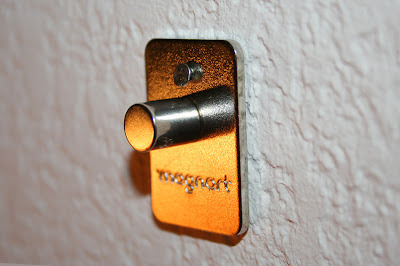 In a later post she said that she’d used a magnetic art display system called Magnart to hang it. 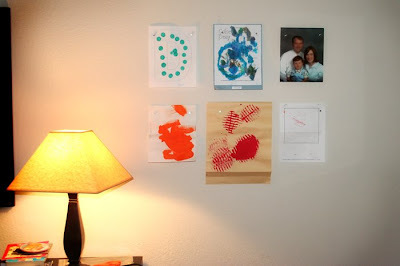 I’d been looking for a way to display my children’s artwork in the living room (something with a little more pizzazz than the tape or colored tacks I usually used), so I got some. I just finished putting them up last night, and I love it! You will notice that, unlike the immaculate silkscreen print Heather displayed in her post, the prints I’ve hung were created by my toddlers and are wrinkled from days sitting at the bottom of my minivan. I assure you that it looks much classier when other people do it. Anyway, it was really easy to install, and the surface area of the metal plates gives you some room for error if you don’t line up the holders perfectly when you hang them. 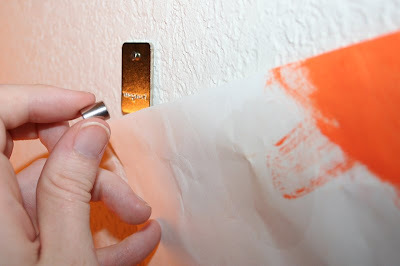 Once you put the plates up you can just slip your artwork in and out by putting them under the super-strong magnet. Another thing I’m going to try is to take some seasonal pictures and enlarge them to 8×10 to put in the Magnart holders — a cheap, easy way to change up the look of my living room every few months! For more tips check out the great list at Works for Me Wednesday! I’m lovin’ this. I’m sure I saw it on Dooce but figured it was only something that a woman with a husband who’s her employee can muster. (Not that I’m dissin’ Jon Armstrong. But, you know, the blog is both their jobs, so if Heather says, “Hang me up some art holders so I can photograph it,” it gets done. I don’t have her creativity or a husband at my disposal. Did you use a level when you hung them? Do they damage the paint? I’m going to be laughing about your comment all day. And, as far as I can tell, the only damage to the wall is the tiny nail you put in (you can pretty much use the smallest size). They also have the option of affixing it with adhesive strips that they claim don’t damage the paint. I love this! This is a great way to display artwork and it’s really classy! thanks for sharing! Oh, and yes, I used a level. It was one of the most exciting days of my four-year-old’s life. He was just beyond thrilled to help me with that. I’m totally going to go get some and do it. Thanks! Great idea but I’m a little concerned about those little magnets. I don’t know how strong they are but be careful with them around little kids who put things in their mouths – there have been serious injuries and fatalities involving super strong magnets included in some toys. Just be sure that the super strong magnets don’t get into the super tiny hands of short people who like to put things in their mouths. Swallowing super strong magnets=very very bad. They really do look good though. I imagine my kids would play with them a little too much. His idea was neat, too. We have three light curtain rods (wooden dowels, basically) hanging in our hallway with curtain clips that we use to display the kids’ work, as well as photos. I’ll see if I can dig up a picture of it. I print 5×7’s from the computer occasionally and switch out pictures (which I hang back-to-back). Off topic, but here’s something that works for me, regarding Bloglines and the feeds for our blogs. I unsubscribed and resubscribed to the broken blogs, and that seems to have worked. I used the Feedburner feeds; not sure what I was using before. Try that & see if it works! We homeschool at our large kitchen table, and I’m always sticking up artwork and various things with sticky tack. It doesn’t hold posterboard and heavier things very well, though. This is a great idea to fix that problem!